The International Art Museum of America is a new museum on the SF art scene. It features a number of works from well known artists from around the world. It includes around 100 pieces of artwork. On display, you will find several styles of sculptures, calligraphy and paintings. They range from the 17th to the 21st Centuries. Mostly Asian inspired artwork is featured in the galleries. You will also get the chance to see some pieces from artists from France, the Netherlands and Scotland. Most of the art here is done by H.H. Dorje Chang Buddha III, a self proclaimed religious leader. He claims to be a reincarnation of Buddha. His highest priced piece sold for more than $16 million in NYC. His works include everything from paintings of animals in action to beautiful calligraphy. He also has several sculptures on display. He uses a technique called "Yun Sculpture." It's colorful, flowing and very unique. My favorite work in the museum is a piece he did. It's a large - almost 6 feet tall - painting that reminds me of Monet's Water Lilies. It includes a colorful arrangement of dark reds, greens and whites with thickly piled patches of color. When you first enter the International Art Museum of America, you will be greeted by an area that looks like a backyard garden. Walk through the garden to the front desk to check in for your visit. You will find that the first floor of this SF museum is a little dark. It's a garden that was designed just for this museum. Don't let this area fool you or steer you away. The area where the artwork is on display is well lit and modern, which allows you to easily see each work of art. After you check in, you will head upstairs to view their pieces. On the way to the staircase, you will get the chance to see the first "Yun Sculpture" by H.H. Dorje Chang Buddha III. Make sure you spend a few minutes learning more about this piece before you head upstairs. The layout of the galleries include several small rooms. Each time you enter a new room, it looks so similar to where you started, that you might think you are done. However, the displays continue through about 15 small rooms and hallways. Unlike most museums, you won't find themes in the majority of the rooms. Expect to see a piece of Asian Art from the 1980s hanging next to a French painting from the 1700s. It will take you about an hour to an hour and a half to visit all of the rooms. 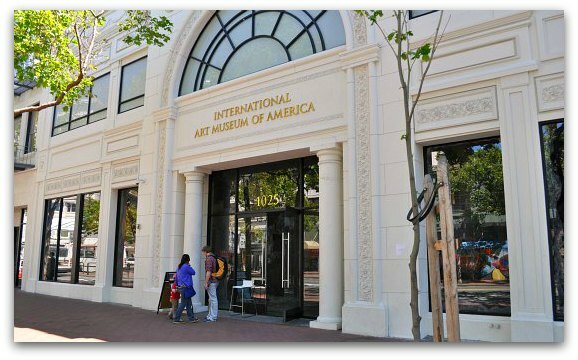 The International Art Museum of America is at 1023 Market Street. This area of town is under a revitalization, so it's still a little off the beaten path. However, it's a quick 15 minute walk or 5 minute bus ride from Union Square. 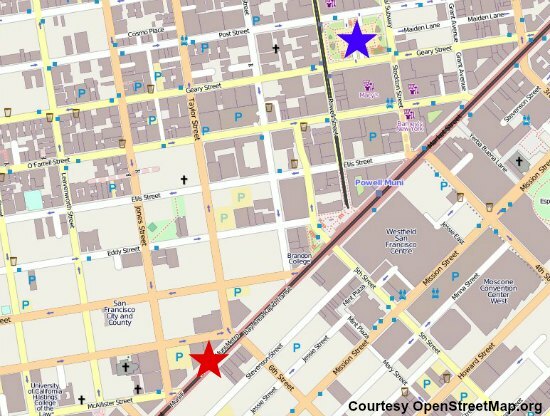 In the map below, it is the red star and Union Square is the blue star. You can pick up almost any bus on Market Street to get here. The 5, 6, 21, 71 and the F Streetcar all drop off less than a block from the entrance. Tuesday - Sunday: 10 am to 5 pm. You must enter before 4:45pm to gain entry. If you want to learn more about the pieces inside the International Art Museum of America, they offer a few free tours. They are every Thursday and 2nd Sundays at 1:30pm. You can also call ahead to book a tour for yourself or your group. Photography is not allowed in the second floor galleries. However, you can take pictures on the first floor. Conservatory of Flowers: One of my favorite "living" museums is the Conservatory of Flowers in SF's Golden Gate Park. It features five temperature controlled areas with different plants from various climates. Here you get the chance to see beautiful orchids, interesting carnivorous plants and large lily pads. Almost all year long, you will also find a fun and entertaining temporary exhibit. Museum of the African Diaspora: In SF's SOMA district is the Museum of African Diaspora. This modern, interactive museum offers you the chance to learn more about the African Diaspora through movies, audio clips and interactive displays. Cartoon Art Museum: If you grew up reading the Sunday comics, then you will love what you find at this museum. It features a few thousand comics and includes ones from the late 1910s to today. Contemporary Jewish Museum: Another unique museum in SF is the Contemporary Jewish Museum in the SOMA district. Here you can learn more about the Jewish Community through traveling exhibits, music and modern exhibits.